New research is looking into how we can better protect sterile environments from airborne viruses. Professor Herek Clack (left) and members of his team set up a lab-scale non-thermal plasma device that has previously been proven to achieve greater than 99% inactivation of an airborne viral surrogate, MS2 phage, a virus that infects E.coli bacteria at the Barton Farms family pig farm in Homer, MI. Nonthermal plasmas — ionized, charged particles formed around electrical discharges such as sparks — are very, very good at rendering airborne viruses harmless, a new study reports. This approach could help us better keep environments such as surgery rooms clean of pathogens, the authors explain, and might even render the surgical mask obsolete. “The most difficult disease transmission route to guard against is airborne because we have relatively little to protect us when we breathe,” said paper co-author Herek Clack, a research associate professor of civil and environmental engineering at the University of Michigan. Exposure to nonthermal plasmas, however, could be just the guard we need. In their study, the team crafted a nonthermal plasma reactor which was able to remove 99.9% of a test virus the researchers pumped through. Best of all, the whole process only took a fraction of a second to complete. The vast majority of the virus sample was rendered harmless due to inactivation, the team notes, with a sliver of the bugs getting scrubbed out of the airstream thanks to good old fashioned filtration. The reactor used in this study looks suspiciously like a piece of pipe — because it is. The real magic happens inside. The team packed borosilicate glass into a cylindrical-shaped bed, which they placed inside the reactor. Then, they pumped a model virus (one harmless to humans) inside the rig, forcing the virus to pass through the spaces between the beads. Then, they started the reactor. The team tracked the amount of viral genome present in the air coming out of the reactor to gauge how it went about neutralizing the pathogens. These measurements revealed that more than 99% of the air sterilizing effect was due to inactivating the virus that was present, with the remainder of the effect due to filtering the virus from the air stream. This two pronged-attack that combines filtration with inactivation is likely much more efficient than currently-available air sterilization techniques, the team reports, such as the use of filtration or ultraviolet light. That’s because these other approaches rely on a single sterilization method — masks, for example, only employ filtration. Even the use of ultraviolet irradiation falls short, they explain, as it can’t sterilize a volume of air as quickly, thoroughly, or compactly as the nonthermal plasma reactor. The team has started a second phase of testing its reactor. 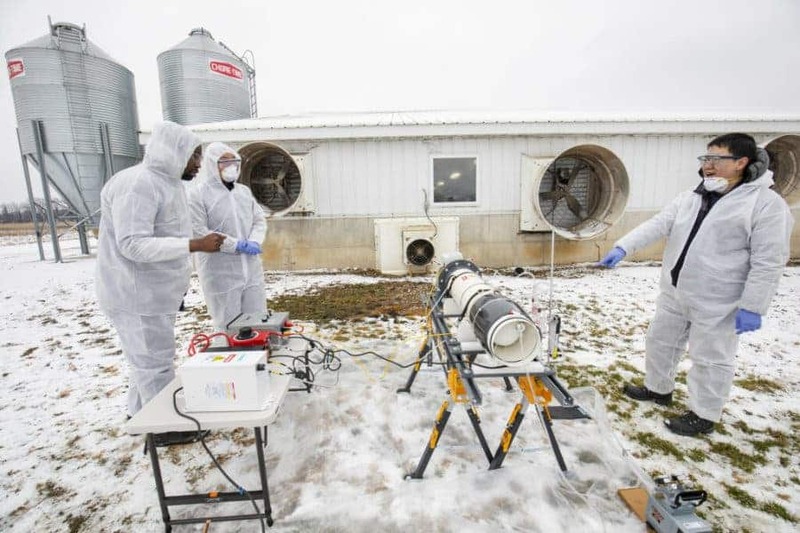 They installed it to the ventilation air streams at a livestock farm near Ann Arbor, where they hope the nonthermal plasma will prove its worth in stomping out contagious livestock diseases such as avian influenza. Fingers crossed! The paper, “Inactivation of airborne viruses using a packed bed non-thermal plasma reactor,” has been published in the Journal of Physics D: Applied Physics.